Is there any ripper and converter for the reach-me-down iPhone 6/5/4? How to unlock the video audio format limitation in the used iPhone 6S/6, 5/5S/5C, iPhone 4S? Answer: Although the phone itself may be old, the software and apps bound up with it is the same, for example, the DVD ripper and video converter designed for any new iPhone can also be applied to the used iPhone. We hope we can help you find a cheap used iPhone video converter and a cheap used iPhone DVD ripper, respectively. 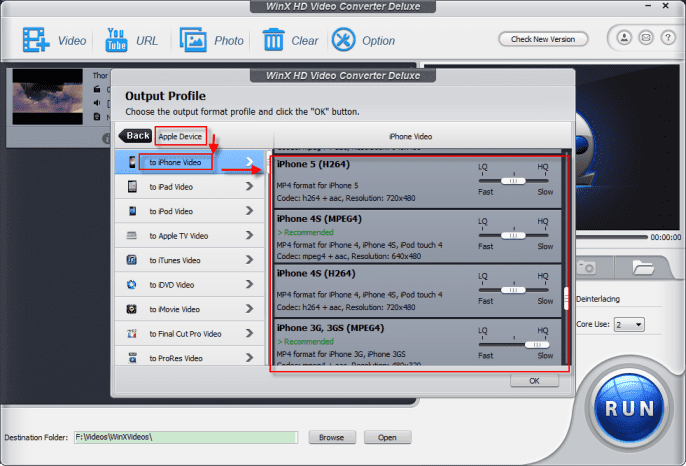 WinX HD Video Converter Deluxe is a rare implementation of converting sundry videos for the used iPhone. No matter the videos are from Bluray, DVD, HD camera, HDTV, YouTube or other channels, they can be made fully compatible with the used iPhone (3GS/4/4S/5/5S/5C/6/6S). Converting MOV, MKV, M2TS, AVI, MPG, MP4, WMV, FLV, VOB, ASF, RM and 4K UHD videos to used iPhone are all out of question by using this HD video conversion software. Of course, it is also the most demanded video converter for any other used phone brands. Step 1. Download the Windows or Mac edition of best used iPhone video converter on your computer. Step 2. Install HD Video Converter Deluxe following the Wizard and then open it. Step 3. Import a source video file that supposed to be not compatible with your used iPhone. It also allows you to download a YouTube video or load an electronic photo album for conversion. Step 4. Scroll download in the "to iPhone Video" column and find the profile that accords your used iPhone 3G, 3GS, 4, 4S, 5S, 6/6S. Step 5. Hit RUN button on the bottom right and start converting MKV/AVI/FLV/MOV etc to the used iPhone. Step 6. Sync the converted videos to your phone to enjoy the untouched video audio effect on the go. WinX DVD Ripper Platinum is especially suitable for any used iPhone because of its abundant device profiles to embrace all types of old iPhones as well as less new Windows OS. To make it more clear, it supports ripping copy-protected DVDs on Windows Windows 98, NT, 2000, 2003, XP, Vista (32 & 64 bit) (let alone Windows 7/8/10) before transferring the DVD videos the used iPhone 3G, 3GS, 4, 4S, 5, 5C, 5S and even iPhone 6/6S. It is also preset with iTunes profile to enjoy movies coming from DVDs on the used iPhone more flexibly. Step 1. Download this Windows-based used iPhone DVD ripper on your PC. If you are a Mac user, please download its Mac edition. Step 2. Install WinX DVD Ripper Platinum following the Wizard and then open it. Step 3. Load the source movie from either a DVD disc or hard drive (in a folder or ISO file). Step 4. Find the profile corresponding to your used iPhone so that the DVD can be converted to MPEG/H.264 video file with specified aspect specific, resolution and bit rate for your phone. Step 5. Click on RUN button on the bottom right and start a fast DVD to used iPhone conversion. Step 6. Last but not the least, sync the videos from your PC/Mac to your used iPhone for offline playing. Both the used iPhone software (for PC and Mac) mentioned above also function as the DVD and video converters good for the used iPod, iPad, as well as second-hand Samsung Galaxy S6, Note 4, HTC One, HTC evo, Desire, Google, Motorola, Nokia, Acer, Huawei, Lenovo, Xiaomi and other used mobile phones, making the 2015 movies enjoyment as fresh as on the new phones. What's New: Apple has released the newest iPhone 6S and iPhone 6S Plus on Sept.9, 2015, learn how to copy rip DVD to iPhone 6S. WinX DVD Author: Completely free but clean DVD authoring software, helps you easily convert and burn home DVD from video files, camcorder, webcam, Youtube MKV, M2TS, M4V, MP4, FLV, MPEG, MOV, RM, RMVB, H.264, AVI to DVD, and personalize it with DVD chapter menu and subtitle.